Parenting after a divorce can feel like walking through a minefield. Not only does a divorce result in changes in family structure that can complicate kids’ lives, but it can also cause kids to experience intense feelings of anxiety and anger. Furthermore, a loss of support and their own feelings of anger toward their ex can make it difficult for many parents to navigate the challenges of parenting during and after a divorce. Here are some tips to help you as you adapt. 1. Keep negative remarks about the other parent to yourself. One of the best ways to help kids cope with divorce is to help them maintain positive relationships with both parents. Conversely, “bad-mouthing” the other parent in front of a kid is extremely damaging to a kid’s well-being. No matter how angry you may be with your ex, talking badly about him or her in front of your children will ultimately cause harm. 2. Remember that your kids are not your confidants. Losing an adult from the household causes a shift in family dynamics, which often puts kids in the difficult position of taking on more adult responsibility than they should. This frequently manifests when parents begin to confide in their kids, instead of talking to other adults. However, remember that your problems aren’t your kid’s responsibility. If you find yourself tempted to share your frustrations with your kids, then take a step back and call a friend or a therapist instead. 3. Do your best to keep your kids’ lives consistent. If you have joint custody with your child’s other parent, then your kids will probably be spending time in two different households that have two different sets of rules. In order to keep your kid’s lives as consistent as possible, do your best to come to an agreement with your ex about which important rules to enforce and how to maintain consistent discipline in both homes. 4. Give kids space to adjust when they first get to your house. Transitioning from one house to another can be emotionally draining for kids. One way to help your children cope with the divorce is to give them time to adjust when they first get to your home. Instead of expecting them to immediately jump into the household routine, consider scheduling quiet craft time or giving them time to read a book or listen to music. 5. Avoid bringing kids into the middle of the conflict. 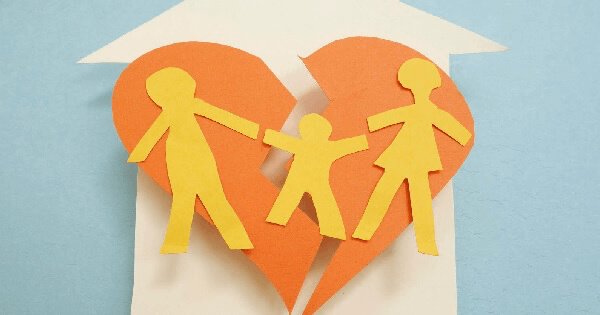 Children of divorced parents should have no role in their parents’ disagreements. In order to keep your kids away from the conflict, make sure not to use them as a weapon or means of controlling the other parent. Similarly, don’t use your kids as a messenger, even if the message is neutral. 6. Address your kids’ anger and anxiety about the divorce. During a divorce, kids are experiencing enormous changes that they have no control over. This often results in high levels of anger and anxiety, which kids may not know how to handle. Furthermore, if you yourself are dealing with strong feelings of anger or anxiety, it can be difficult to find the wherewithal to support kids’ emotions without feeling overwhelmed. If this is the case, consider finding a therapist for your child. Speaking to a therapist will give your child an outlet for expressing the difficult emotions that he or she is feeling. If you find yourself struggling to cope with the challenges of parenting during or after a divorce, don’t hesitate to seek professional help for yourself. A licensed therapist will be able to provide you with emotional support, as well as personalized suggestions for how to best help your kids cope with the effects of divorce. At Untangle The Knot, we know how complicated and challenging divorce can be, and parenting is just one aspect of that. Whether you’re in the process of going through a divorce or you’re struggling to adapt to life after marriage, we have the resources and tools to help you reach the other side in one piece. Contact us to learn more about how we can support you with parenting and all of the other challenges throughout your divorce journey.